This is a fantastic French Art Deco modernist desk set. 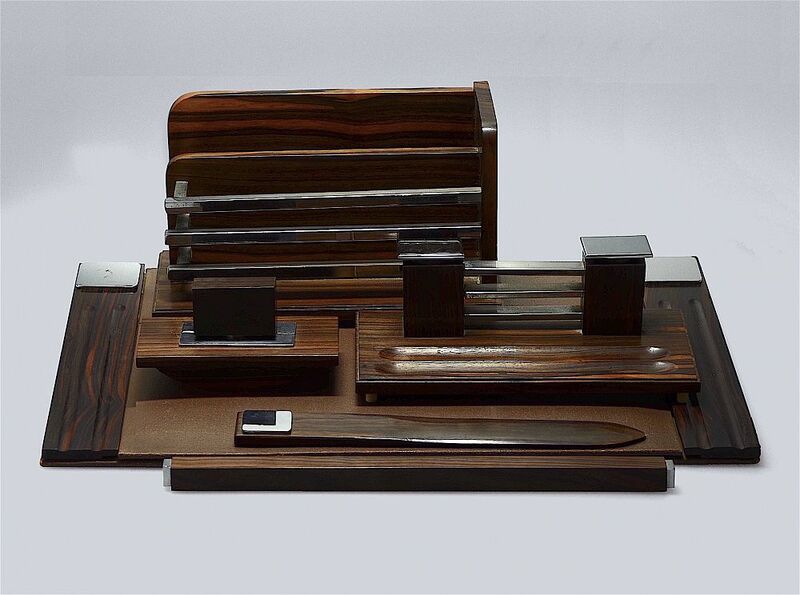 There is a letter rack, double inkwell, blotter, paperknife, ruler and desk pad all made in macassar ebony with chrome decoration on the double letter rack and double inkwell that also has chrome tops. There are square chrome bars on the rack and inkwell and chrome plaques on the desk pad and paperknife and the ruler has chrome ends. The desk pad opens out to reveal the gold embossed retailer's label embossed "L.Beuve-Mery Objets d'Art 8 Rue Joseph le Brix Vannes". Good - the chrome bars on the letter rack & inkwell have some losses and there is a small repair to the macassar on the edge of the desk pad . There is an ink blot on the macassar of the inkwell and the leatherette has some marks.